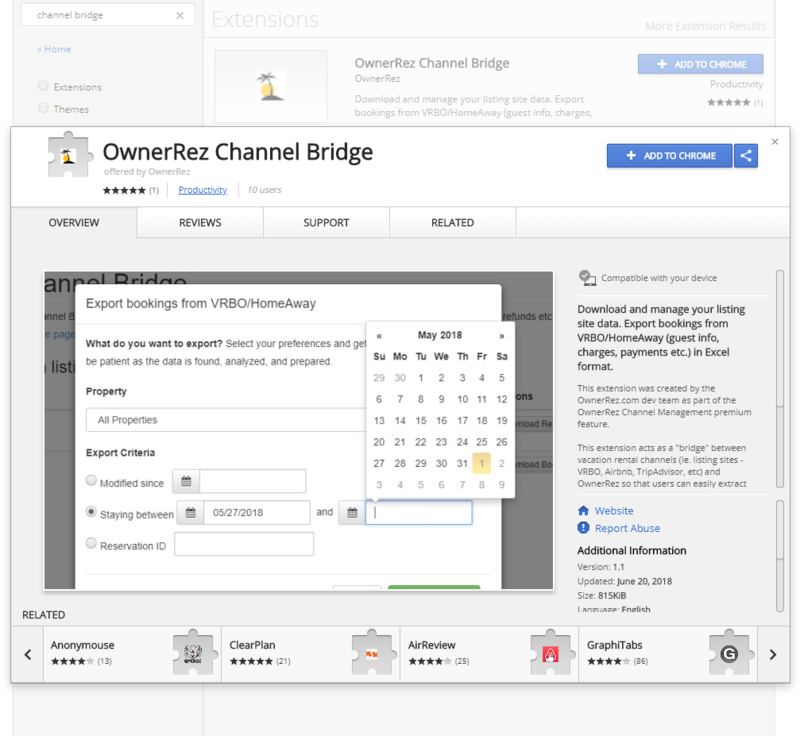 We've created a tool called "OwnerRez Channel Bridge" which is a Chrome browser extension that gives you extra functionality when working with listing sites. Read about it in our our Channel Bridge Overview article. But how do you install and use it? This articles covers where to go and what buttons to press to get started with OwnerRez Channel Bridge. If for some reason that link doesn't work, go to the Chrome Web Store and search for "Channel Bridge" or "OwnerRez". You must use the Chrome browser to get this extension. It will not work in Internet Explorer or Firefox. When you've found the extension in the Chrome Web Store, click to open the extension details. This shows you screenshots of the tool in action, how many other people use it, reviews and so on. After the extension details opens, click the Add To Chrome button at the top right of the extension. After a minute of churning, Chrome will notify you that it's installed and you'll notice a new button in your browser showing the OwnerRez palm tree icon. That's it! It's fully installed. Now, just click that button and the Channel Bridge screen will open and you'll be ready to go.